Mason Jar Salad - Make Salad in a Jar! Mason Jar Salad is a genius way to conveniently pack multiple salads at once, plus they’re pretty fun to look at (and eat!). Read this post for tons of salad in a jar ideas! I love healthy dinner options, and salad is one of the best ways to get those healthy nutrients that we all need. Preparing salads in advance via salad in a jar (Mason Jar Salad) is a healthy, time-saving alternative to the hectic rushing around that occurs when you just don’t have time to make a healthy salad. And all too often, if you don’t have time, you’ll just skip that healthy option. Anyway, I’m sure you have seen the idea of salad in Mason jars around a time or two (or three hundred). Honestly, I’m not even sure where I first saw this or how long this idea has been around, but it takes eating salad to a whole new level! What are the benefits of a mason jar salad? Whoever thought of Mason Jar Salads is genius. Genius! Do you want to know why? Because what salad loving fool likes to make salad each and every time they want salad! I mean, come on people. Do you know how many times a week I would make a salad for lunch (or for an evening snack for that matter) if it didn’t require me getting each and every ingredient out to prepare? Does that make me sound lazy? Well, you know… whatever. Should you put dressing on the bottom of your mason jar salad? Now, the story goes you’re supposed to put the salad dressing on the bottom and then layer your ingredients on top of that. In fact, that’s what I did for the photos in this post. But I’m just not there yet. Frankly, I don’t know what kind of dressing I want until I get ready to make my lunch. Is it an oil and vinegar day, a ranch day, French, Italian? Who knows how I’m going to be feeling. So, when I’m not taking Mason Jar Salad photos for the blog, I layer my veggies and add my dressing later. I am totally breaking the Mason Jar Salad rules and I’m okay with that! What are the layers of a mason jar salad? Your heaviest ingredients that will hold up when touching/sitting in the dressing. Think beans, corn, etc. Heavy ingredients that won’t hold up when sitting in dressing (like tomatoes). A few heavy toppings. Nuts, croutons, and dried fruit are good choices here. Mason Jar Salad top layer: Something colorful and fun (optional); the LunchBoxBunch used fruit and even edible flowers. When should you eat mason jar salad? A lot of people think of Mason Jar Salads as on-the-go salads. Pack ’em in your lunch box to take to work or put them in a cooler for a visit to the park or some other place outside the house. But you can also use them to save time when eating at home! Yep, I actually use salad in a jar as a way to pre-assemble the salad that we’ll eat later at home. It’s impossible to skip the healthy dinnertime salad when it’s staring at you from the fridge looking pretty! We’re actually having salad in a jar for dinner with the Crockpot Bountiful Beef Stew that has been cooking all day. Try it for yourself so you’ll believe that salad in a jar really isn’t too good to be true! 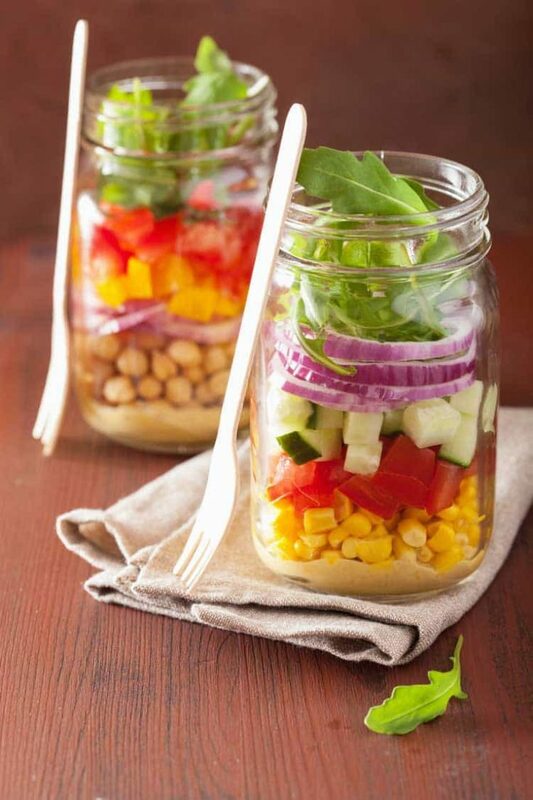 You'll love these fun Mason Jar Salads! Your favorite salad veggies. We used a variety of veggies like corn, chickpeas, tomatoes, cucumbers, onions, and lettuce. Salad dressing; harder veggies like carrots, pickles, olives, peppers; tomatoes, lettuce; top it off with meats, cheeses, nuts, or anything you do not want to get soggy. Salad can be prepared at the beginning of the week and will last for up to a week in the refrigerator. For best results, layer according to directions above. Makes as many Mason Jar salads as you would like to eat in a week. Prep time 20 minutes and you're done! I hadn’t actually heard of this – do the jars keep the lettuce from turning brown? I too would eat it a lot more often if I didn’t have to get everything out all the time to make it. I’m really curious about this, but I’m wondering if it keeps the salad fresh…. Hmmmm, something else to try! Jessica, this has inspired me to start making salad to bring to work again. This salad would certainly make me look like a Trendy Wendy! The photos are great and glare free! Great job…I’m sold! Glad to have inspired you Emma! Love the ‘Trendy Wendy’ saying. I hadn’t heard that before. I vouch for this method as I do it all the time with my fruit and veggies. It works so well and increases our veggie and fruit intake immensely. It also speeds up dinner prep. Blessings! Thanks Diane! I’m new to doing this but am loving it. I can see that it could really help with veggie/fruit intake as well as dinner prep. I already have a salad ready for dinner each night this week. Definitely can’t beat that. I didnt know this was all the rage!! Thank you for making me one of the cool kids now – LOL have to go get some jars for my salads! Your pic turned out great by the way! I seen these years ago when I was working, tried it also. Worked but I still prefer a bowl it was a little scary traveling the jars back and forth. Pic looks good, love the colors of a salad in a jar. I have friends who’ve done this. I like making my salads in anything with a lid because I can shake it and distribute the dressing evenly. It’s nice when an internet ‘rage’ is healthy! This is amazing! I just might eat more salad if I do this! This would be a great addition to a meal brought to someone who just had a baby, recovering from surgery, etc. What a cute idea! Do you need to vacuum seal it? Nope- just screw the lid on and you should be good for up to a week. I always let me lettuce dry most of the way on towels before placing it in the fridge. Will this work with bagged lettuce? Well, I’ve got the Mason jars and have been wanting to try this. Another blogger posted it but said to use only romaine or iceberg lettuce. We buy spring mix and baby spinach. Has anyone tried it with leafy lettuces? I love salad but don’t eat it often due to preparation. Hi Lilajean! I think other leafy lettuces would be fine. I’ve used them myself… I just don’t make as many and use the salads up within a 2-3 days instead of the up to a week that iceberg and romaine can last. awww ok, got answer to my question about length of time these will keep, so now, Im buying mason jars for salad prep. My husband will love me as he loves “salads” every night, and I would too if I had them ready. Thanks for your great prep tips!!! Lets be healthier!!! How long will these stay fresh? For example, If I am trying to meal prep on Sunday afternoon, how many days worth of salads should I prepare? 1-2 or will they stay fresh in the mason jar a little longer? I’ve made them and used for 3-4 days.